In a world where we can purchase a home entertainment system with the click of a button or order season tickets for our favourite hockey team through social media, marketing is at a turning point. As a result, marketers have access to more data than ever before. But now that they have it, what’s the best way to use it? How can all of this data help marketers improve return on investment (ROI) for their organization? 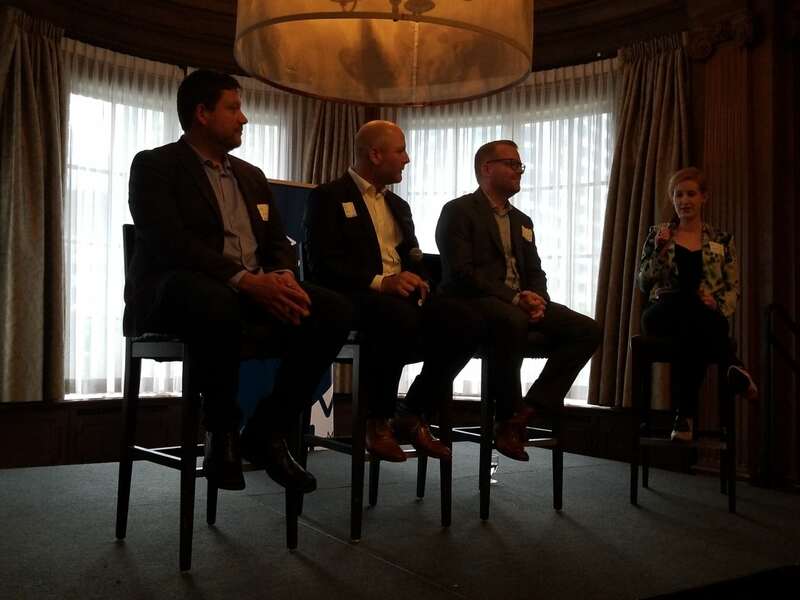 On Wednesday, September 19, 2018, BCAMA tackled these questions head-on at a Thought Leadership Series (TLS) event. 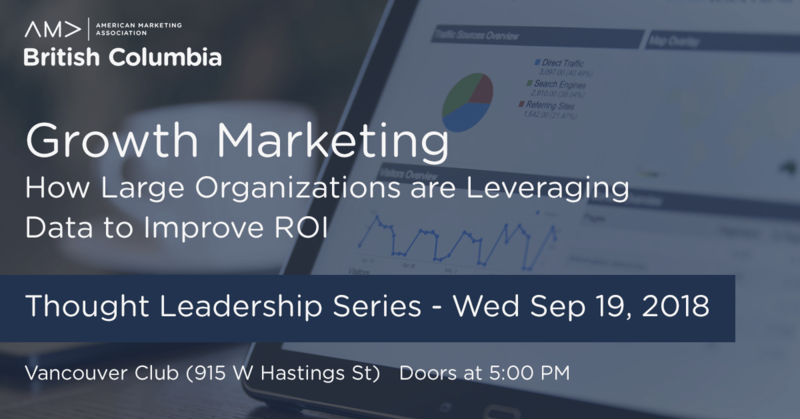 Titled “Growth Marketing: How Large Organizations are Leveraging Data to Improve ROI”, this presentation and panel discussion explored what marketers can do now to improve their marketing efforts with data and ultimately improve ROI. The panel discussion featured Graeme McLaughlin, Senior Conversion Optimizer, Optamo; Kevin Kinghorn, Vice President of Marketing, Vancouver Canucks; and Matt St. John, Head of Digital Intelligence, Best Buy Canada. The moderator was Krista Brown, Manager of Member Insights, Coast Capital Savings. Kevin Kinghorn started his presentation with a powerful statement: “Data is great, insights are better.” In other words, it’s great to have the numbers, but knowing the who, what, where, when and (most importantly) the why is going to help you understand your customers and provide them with a better experience. For Kevin and his team, it’s important that they understand what they’re getting out of the data before diving into it. Read more about how to connect the dots between data and insights. According to Graeme McLaughlin, the best way to understand the why is to actually talk to your customers. His favourite method of getting in front of the customer to ask questions is conducting one-on-one customer interviews over the phone (tools like Calendly are a great resource for this). If that isn’t an option, talking with your sales team or customer service representatives to understand the biggest questions and barriers will help you build your understanding of your customer.understanding of your customer. A key theme across all three presentations was to start small with your data journey. For Matt St. John and his team at Best Buy Canada, this literally meant a small team, but as they progressed along their journey their team grew as well. It also meant starting with the bottom of the marketing funnel (purchase and evaluation) before moving up towards to the top (awareness), and developing a deeper understanding of how top of funnel campaigns impact lower funnel activities. Graeme also emphasized the importance of starting small. His advice? Start by finding and fixing what’s broken, including the pages on your website that are broken or that aren’t performing their best. You can do this by taking a look through your Google analytics, finding pages that aren’t performing well and diving a bit deeper into those insights we talked about earlier. Matt credits a lot of their success to his team. That’s why they implemented a weekly meeting where all of the right people from across the organization could be in one room to share ideas and be heard in an open and safe (but structured) space. This allowed their people to be creative and innovative – in a world where technology and data are creating a tsunami of change, this type of work environment is key to staying in front of the wave. Thank you to all of our sponsors, speakers, and organizers who made this month’s TLS event a success! Subscribe to the BCAMA newsletter so you don’t miss out on future TLS events like this. If you missed the event and want to catch up – check out the Twitter Moment!